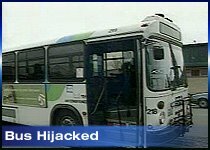 SPOKANE, Wash. -- A man hijacked a Spokane Transit bus at gunpoint Friday and demanded to be driven to a tavern, where shots were fired before he was taken into custody. STA spokeswoman Molly Myers says no one was injured. Myers says the bus was on a scheduled layover at the downtown intermodal facility when a man with a gun boarded and demanded to be taken to the Hillyard neighborhood in the city's east side. There were no other passengers. Tyrene Mellon, a bartender at the Special K Tavern in the city's East side, said a man she knows as a customer showed up with a gun and fired shots. She and other bar patrons disarmed the man and shoved him outside, where he was arrested by police. Spokane Police spokesman Corporal Tom Lee says the man fired two shots, but missed. Myers says the man told the bus driver he "just wanted to go to jail."